The “Southern Pacific Overcrossing” as it looks from Jackson Street. As I mentioned and as the plaques on the bridge say, the “Southern Pacific Overcrossing” was finished in 1939. What they don’t say is that the Mountain States Construction Co. of Eugene and a subcontractor built the thing in less than one year. The Highway Commission awarded the contract on Jan. 31, 1939. 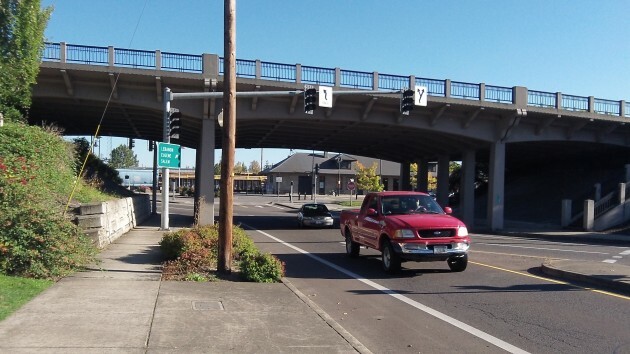 Actually it awarded two contracts, one to Mountain States for the overcrossing in the amount of $135,970 and another for grading the approaches and paving the intersecting streets to Roy L. Houck of Salem in the amount of $113,461.50. The Oregon highway engineer declared the project completed on Dec. 16, 1939, and accepted it four days later, on Dec. 20. Those, obviously, were the days when things got done. In addition to the structure and grading contracts, there were other costs. The files yielded a summary of expenses, showing a total of $367,288, comprised of $189,669 for the roadways and $177,288 for the structures. The federal government bore $287,123.35 of the total under a 1916 law, amended several times, authorizing U.S. spending on post roads. 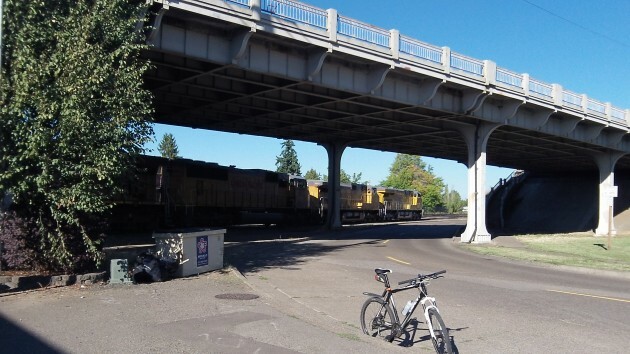 I had asked Rick Little, the regional ODOT spokesman, if the agency had any background on this project. He checked with Salem, and somebody there started digging through boxes in the archives. I’m sorry my request was the cause of this extra work, but I’m grateful for the information. This overpass was the result of the highway department wanting to reroute Pacific Highway East past the outskirts of Albany. Until then, the highway had come into town from the south on Elm Street, wound it way down to First, then to Main and out what is now Salem Avenue toward the north. It was no simple project. The files include an order by the public utility commissioner authorizing the closing of 11 railroad grade crossings and opening six new ones. My dad worked on the heavy equipment that dug the lake in 1939. I have a photo to prove it!